Type of works: supply of Leaderflush Shapland's Designer and Extended Performance doorsets. Salisbury Law Courts, one of the newly combined court centres commissioned by Her Majestys court service, accommodates wide ranging facilities whilst providing a building that is highly environmentally conscious. 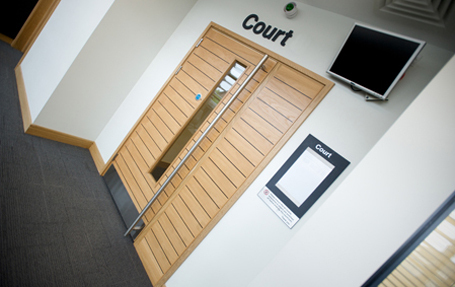 216 Leaderflush Shapland doorsets were supplied to Salisbury law courts from the Designer and Extended Performance ranges to meet performance characteristics of 60 minutes fire resistance and 40RwdB sound reduction. Veneered doorsets were supplied in crown-cut European Oak and also in a Horizontal Oak with a Black inlay to give a striking effect. AV1 and AV2 doorsets were also supplied from the Extended Performance range in order to provide increased security. Leaderflush Shaplands exclusive doorset core, EnduraCor, was specified for Salisbury Law Courts, particularly for its durability and stability characteristics. In a recent independent test, EnduraCor was shown to be one hundred times more durable than multi-layered chipboard, achieving 1,000 more impacts than required by EN1192 Class 4 (at which point the test was stopped) as well as achieving 2,000,000 cycles, 1,000,000 more than required by EN1191 Class 8. This highly cost-effective solution could significantly reduce whole life repair and maintenance costs and helped contribute to Salisbury Law Courts achieving an Excellent rating in the BREEAM scheme, as EnduraCor is manufactured using sustainable materials and contributes to the BREEAM assessment when ordered as FSC. Salisbury Law Courts was also awarded first prize under the BREEAM Courts scheme at the BREEAM Awards 2010 held at Ecobuild in London earlier in the year. Leaderflush Shapland, the UKs largest bespoke performance door and doorset manufacturer, combines long experience and a tradition of craftsmanship with the most efficient production techniques to ensure that every doorset supplied meets or exceeds expectations.